A fat dude enjoying life. Enter your email address so my amazing blog emails you every time a new post goes up, or just use RSS like a normal person. Restocking my desk’s shelf with toys! My lights are all in place on the shelf connected to my desk, and I’ve started to fill them back up again! I took the opportunity to switch all the Transformers on my desk to the opposite of what they were when I took them down. It was pretty fun getting into all the different transformations, especially since I haven’t done most of them in a very long time. 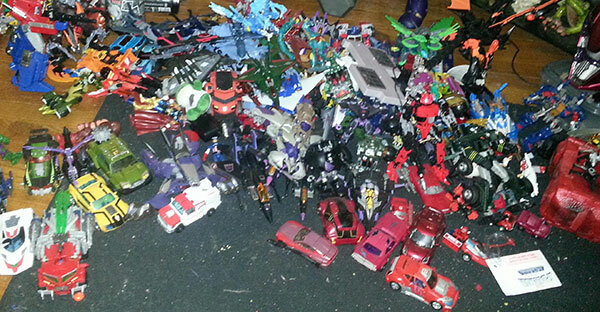 The copious amount of Decepticons I have from the Prime series takes up quite a bit of space while in their alt modes. I’ll be switching them back to robots first to reclaim space. Here’s a few pictures to show where I am thus far. The ‘cons take up two thirds of the shelf, so I’ve had to move the Predacons to a lower spot, since they don’t all fit together. I’m okay with it because I’m a sucker for these dragon guys, and I’ll probably fiddle with them more while they’re closer. I’m also enthralled with the new “simplified” Predaking, so I’m thinking about doing a full post just on him next week. I’m giddy when I look at him! You can see that there’s still a lot of clutter on the wide shot, because I’ve just picked everything up off the floor and stuffed it on the desk so I could feel like I was cleaning up a little bit. I’ve got plans to move my three favorite characters (Skywarp, Cliffjumper, and Hound) to a different shelf for a more prominent display in my room. I don’t know how museums curate their collections. I have so many things I want to display, but limited space with which to do so. It’s tough discerning what I want to take down to make more room, and it’s a very inexact science of cycling things out. I’ll be back with more pictures as things settle in after all my rearranging! 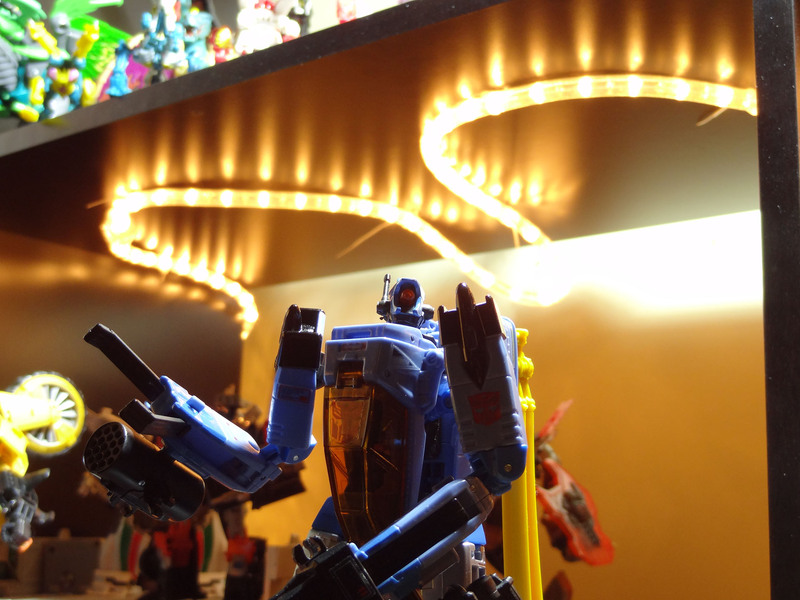 Posted on April 24, 2014 April 24, 2014 Categories Toy RelatedTags autobots, collection, decepticons, display, predacons, transformers, transformers primeLeave a comment on Restocking my desk’s shelf with toys! I redid some lighting today! The shelf next to my desk — er, rather, attached to my desk — is where I put the toys I’m most enamored with so I can easily fiddle with them as I see fit. When I bought the shelf from Ikea, it was twelve 13″ x 13″ cubes, so I set the lights up to wrap into each cube, around the dividing wall. I had the idea recently that I’d like the shelves to be open instead, so I took the dividers out to leave me with two large spaces. I only have one decent picture with an example of how it looked. 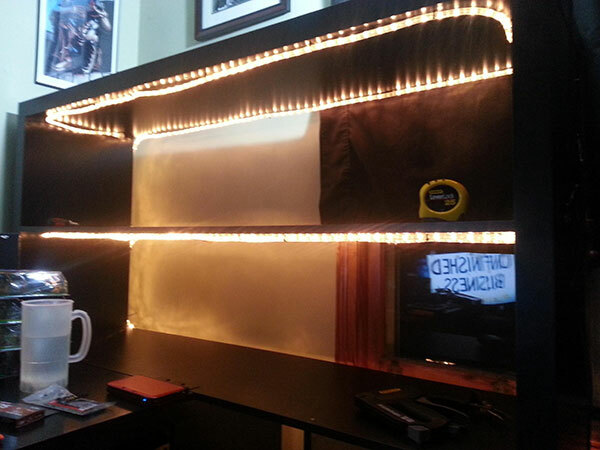 My OCD finally caught up to me, and I decided to unload the stuff on the shelving unit and redo the lights properly. I swear it doesn’t look like this much stuff when it’s all set up properly, but on the floor it looks like a lot! It also gave me an excuse to set up the scanner the old man got me for Christmas. Four months isn’t that bad, right? Right? Posted on April 21, 2014 April 22, 2014 Categories Toy RelatedTags display, shelves, toys1 Comment on I redid some lighting today! Displaying a collection is difficult. I’ve got a decently sized collection of toys, and it’s becoming hard to display everything I want to. I switched to a mindset where I wanted a clear, concise view on my shelves, so I started rotating out figures as I saw fit. Now I’m at a point where I really enjoy everything on display, and I’m running out of excess storage space. Dorena has offered to let me expand outside of my office, but it felt more like a platitude. Besides, I spend so little time in other rooms in the house that I wouldn’t appreciate the things I put out there. My buddy, and fellow collector, Josh had an interesting display quandary that I helped out with this week, and I wanted to share what I came up with. 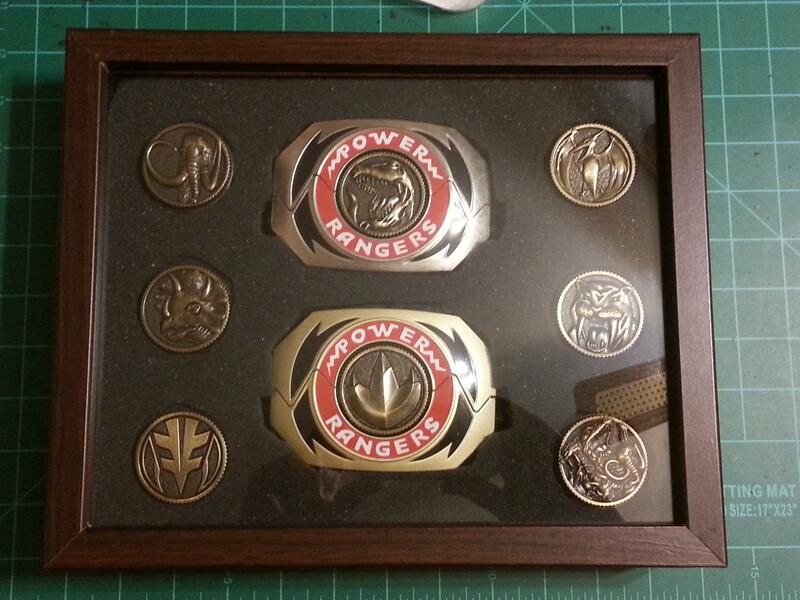 He picked up some anniversary edition Power Ranger Morphers and wanted to stick them into a shadowbox. He snagged some dense shipping foam from work as a backing material, and it was up to me and Dorena to piece it together. It was a fun challenge, and I’m quite pleased with the result. I used a small hobby hand saw to cut the correct dimensions for the box, then shaved out compartments with a paring knife and kitchen shears, so the coins and Morphers were held firmly in place. Check it out! Pretty neat, right? I’m mildly concerned with the built in hook on the back being strong enough to support the weight, so I’m not sure how it’s going to go on the wall yet. I’ll have to ask Josh for a picture to share when it’s in place! Posted on April 17, 2014 April 17, 2014 Categories Toy RelatedTags display, josh, power rangers2 Comments on Displaying a collection is difficult.